Jodi, Murphy, and their girls plan on welcoming a new member to the family this weekend. It’s something every mother must face sooner or later, but how do you deal with it? Why it’s so hard for Puerto Rico to get the aid that they need in wake of Hurricane Maria, and ways we can help now. MSJ has all the info at 11:05 minutes into today’s show podcast below. Save the Children is currently on the ground in Puerto Rico responding to the needs of children. We are coordinating closely with the local partners on the ground to assess the specific needs of children and families amid reports of massive damage. All donations to this fund will support hurricane recovery and relief efforts in the Caribbean. Initially, the fund will help first responders meet survivors’ immediate needs for food, fuel, clean water, hygiene products, and shelter. Once initial relief work is complete, this fund will transition to support longer-term recovery efforts run by local, vetted organizations responding to this disaster. Whether its food, drinks, shelter or cleaning supplies, The Salvation Army is ready to provide practical assistance. And we won’t stop when the winds die down and the flood waters recede. We’ll remain until the healing is complete, until all this devastation is but a memory. Can this professional organizer be able to fix Murphy’s issue? Kids show us the way!!! Jodi’s Good Thing story today highlights this 3rd grade sweetheart, Livi. She’s been worried about children in shelters after hurricanes – here’s what she’s DOING for them. 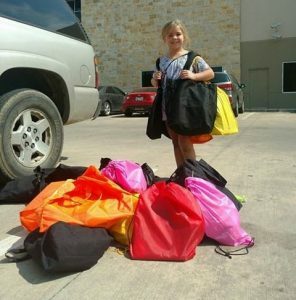 Livi has a huge heart and has been running a campaign to help the kids affected by Hurricane Harvey. She has been putting together what she is calling Happy Heart Kits. She started this with her own personal things from home. It is a backpack with a coloring book, crayons, 2 reading books, a small toy and a stuffed animal. Her goal is at least 100 bags. You can read all about it at Livi’s Happy Hearts on GoFundMe. And while you’re there, feel free to make a donation: Livi’s Happy Hearts for Harvey Kids. Kit Harington (John Snow) Gets Engaged To Former ‘Game of Thrones’ Actress. It’s official! Kit Harington is engaged to former ‘Game of Thrones’ co-star, Rose Leslie. Jodi shares this Hollywood Outsider at 4:25 minutes into today’s show podcast below. Kit Harington and Rose Leslie, who played lovers in HBO’s Game of Thrones, are taking the love plunge in real life. The two are engaged to be married. After People.com broke the news Tuesday quoting a source, the BBC then featured an official engagement announcement the families published in the Times of London newspaper. We learned a little something new about Producer David…and we are FASCINATED by it. Have you ever heard of this procedure? Bill Clinton is the first President to do this – and it’s coming to Showtime. Jodi shares this Hollywood Outsider at 4:46 minutes into the show podcast below. Set to be published in 2018, the book tells the story of a sitting U.S. president’s disappearance, with the level of detail that only someone who has held the office can know. Clinton and Patterson’s collaboration on the novel marks the first time an American President has ever co-authored a thriller. The rights were acquired by Showtime in a competitive situation, with many networks and streaming services trying to secure the rights. It is said that CBS chairman and CEO Leslie Moonves’ longstanding relationship with both Clinton and Patterson was instrumental in bringing the project to Showtime. To begin – the red sauce doesn’t even have to be hot. That’s why this recipe is great for leftover red sauce. It should be perfect and ready after 3 – 3 ½ hours. SO good!!!! ***no need to go heavy on any of the layers. But use the amounts YOU like. There is no hard measurement for the cheeses…..that’s your call. Season ribs evenly with salt, pepper, paprika, and chili powder. Rub in on all sides. Add honey, soy sauce, and garlic to a large slow cooker. Transfer the ribs to slow cooker and turn them over in sauce until coated. Position the ribs so they are standing up, with the meatier side down, and so the meat side is against the walls of the slow cooker, with the bone sides facing in. Cover and cook on high for 4 hours, or low for 7 – 8 hours. Check after the allotted time, you want to make sure the meat is cooked through and tender. Remove the ribs and transfer to cutting board. Cut between the bones to separate into individual ribs. Serve with additional sauce from the slow cooker, as needed. Wash & pat dry the chicken parts, then place in slow cooker. Sprinkle with garlic powder and pepper. In a mendium bowl, stir the soup, soup mix and 1/2 cup of water together. Pour over the chicken pieces. Cover and cook on low for 8 hours. Serve over rice. Sprinkle the roast with the dry soup mix, rub it in on both sides. Place the roast in the slow cooker. Then spoon the mushroom soup into the slow cooker on and on the sides of roast. Cover, and cook for 6-7 hours on low. The juices with mix with the soup and make a GREAT gravy! You CAN add fresh carrots and potatoes. We serve it with rice since there’s so much good gravy. Place roast in slow-cooker and cover with BBQ sauce. Cook on low till roast just falls apart! Jodi cooks it for about 6 hours. Serve it with a salad and a starch for dinner. Then as a sandwich for leftover the next day! Easy and delicious!